The A340-600 was designed as an early generation 747 replacement. It is more than 10 m longer than a basic -300, making it the longest airliner at present in production; greater than 4 meters longer than the Boeing 747-400. It continue to grasp the record for being the worlds longest commercial aircraft but not until the first Boeing 747-8 Intercontinental is showed up in 2009. 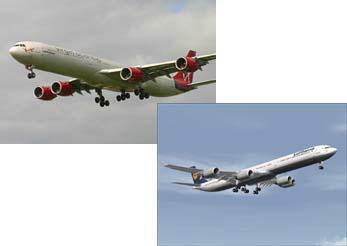 Other version is the A340-600HGW (High Gross Weight). Emirates Airline was the first to order this type of aircraft.